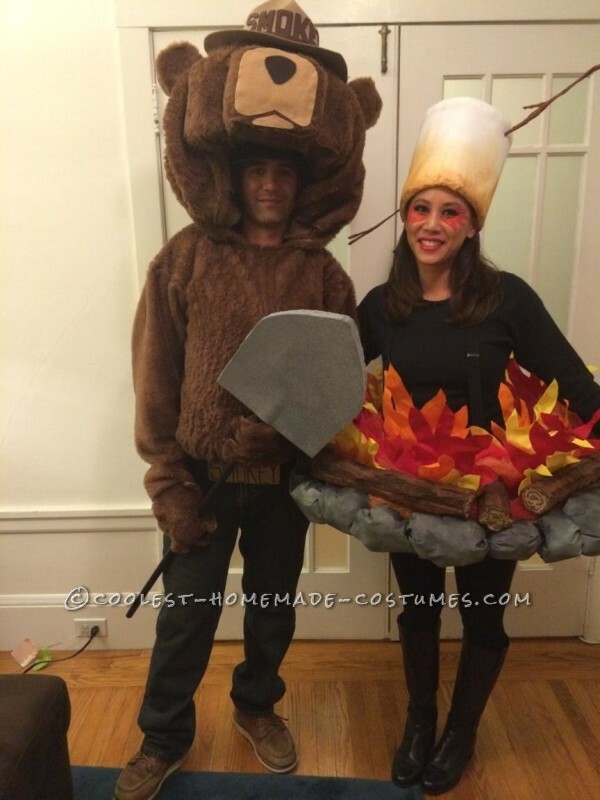 Original Smokey the Bear and Camp Fire Couple Costume - Only You Can Prevent Forest Fires! Punniest Homemade EyePad (iPad) Costume Ever! 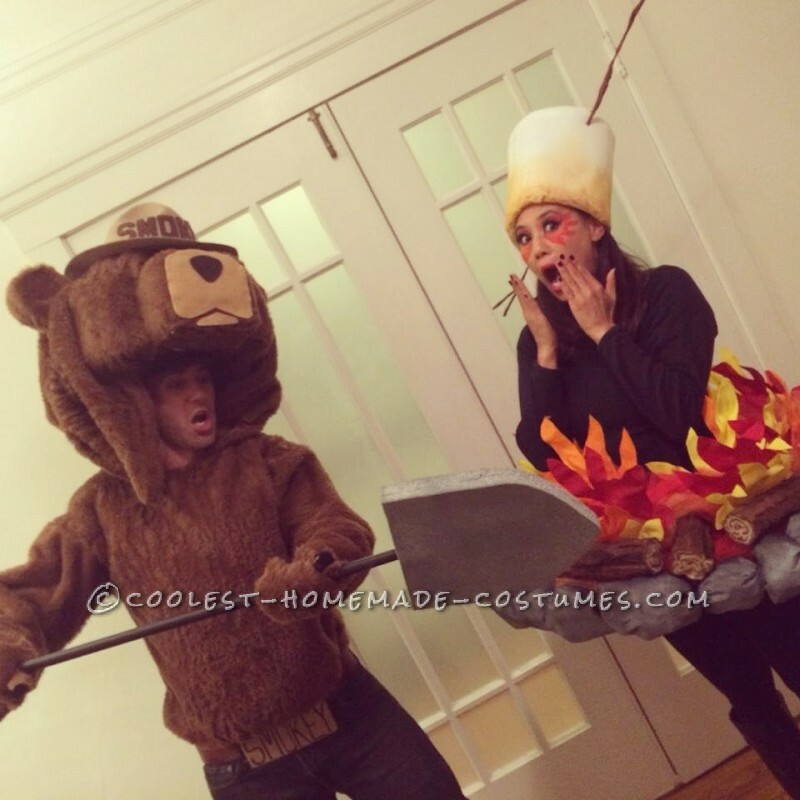 Original Smokey the Bear and Camp Fire Couple Costume – Only You Can Prevent Forest Fires! After being away from my boyfriend for three years due to a long distance relationship, I was finally able to celebrate Halloween with him this year. And what better way than doing a couples costume! We didn’t want to do any common couples costume like Popeye and Olive, or Mickey and Minnie Mouse; we wanted to be original. After a lot of thinking and browsing ideas, we came up with Smokey The Bear and a Camp Fire. 3. Head- found foam sheets at Home Depot or Joanns. Stacked three foam sheets on top of one another and took a box cutter to slice away and carve out the head. Ears of the head we carved out separate and glued them on. To cover the head, we took the same material from the body, draped it over the foam, and glued it with a hot glue gun. We left extra material dangle that we could tuck into the neck of the shirt. The ears were wrapped and glued with the furry fabric before attaching them to the head. Then, with lighter colored brown and black felt, we cut out and glued on the mouth and nose. To fit it on his head, we cut out a hole at the bottom of the foam. He was able to wear a hat as well so the rim of the hat could add support. Lastly, we tied the hat onto the head. 4. Shovel- old plastic pipe, and a foam sheet we carved into a shovel shape. Slice a small slit on the flat edge and slip in onto the plastic tube. 5. Smokey name on belt and hat- used felt letters for the hat, and just a piece of cardboard written with pen for the belt. We made two duct tape loops that attached onto the back of the smokey cardboard belt buckle for the belt to slide through. 5. Gloves- using an old pair of gloves, we covered them with the furry fabric that had been cut out in the shape of a paw. 2. Marshmallow hat- used white felt to cover wrapping bubble sheets to form a sturdy cylinder shape. To give it the illusion it has been roasted, I took light colored brown paint and lightly dabbed/smeared it from the rim to the center of the hat. Cut two small holes, opposite sides of the cylinder, one higher than the other, for the stick to go through. For the stick, I bent wire in the shape I wanted, wrapped it in painters tape, and painted it brown. Once it was dry, I slipped the wire stick through the holes in the hat. 4. Fire-pit frame- I got an old hula hoop and wrapped it with chicken wire. I made four slits in the wire at the center of the hoop and folded the chicken wire back so I could stand in the middle of it. 5. Rocks- I sprayed cheap white cloth with grey, black, and white paint. I cut out some large circles, and stuffed it with old news paper to make ball shapes. I then attached them to the outer rim of the hula hoop. 6. Flames- I bent florist wire in all kinds of flame shapes. I then laid them on table cloths material found at Joanns, sprayed the wire and cloth with spray glue, and sandwiched it with more fabric. Once it was dry, I cut out around the wire. I attached them to the chicken wire with more wire and staggered them throughout the circle. 7. Wooden logs- using old swimming noodles, I took a box cutter and shredded the noodle into the shape I wanted. I painted them brown and then dabbed them with black paint to give it the look of burnt wood. I used lighter colored brown felt to cover the ends. I laid the logs on the edge behind the rocks, but in front of the flames. 8. Lights- The best part of the costume that got the most attention and gave it the most realistic look, was the glowing lights. Battery operated flickering or strobe lights found at the dollar store, were placed throughout the ring. People could spot me a mile away! 9. I attached the suspenders to the chicken wire around the hole where my body would go through so the entire fire pit could hold up around my waist. My boyfriend and I couldn’t have asked for a better couples costume. We won the costume contest at the party we attended, and got lots of compliments about how realistic everything looked. People wanted to know where we bought our costumes and were shocked to hear we made all of it! I also posted our picture on Facebook and got over 110 Likes with comments on how it was the best costume of the year. I would definitely recommend this to anyone looking for a fun couples outfit. Great idea – loving the marshmallow. I’m going to try this next year.